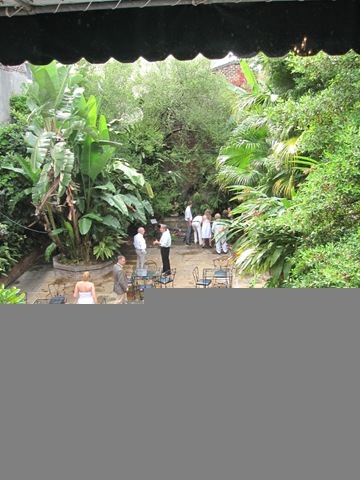 We departed from the hotel just after breakfast on foot. 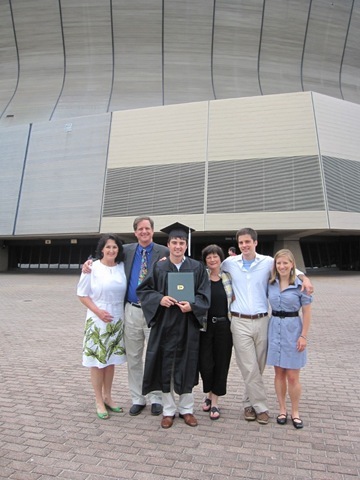 It was about a 30 minute walk to the Superdome, but we were thankful for the exercise. We got there at 8:45 just before our seats were given away! 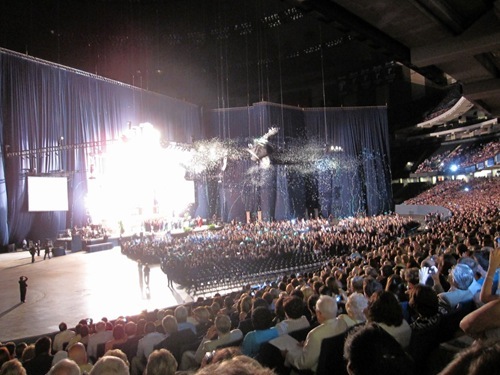 The commencement was very fitting for New Orleans – jazz, beads and fireworks. 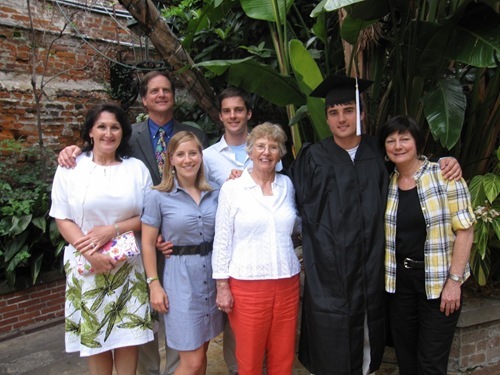 Andrew’s class is “the Katrina Class.” As soon as he had finished moving his stuff into his dorm in 2005, he turned around and evacuated for the hurricane. He didn’t see his stuff again until January! Collages all over the country took in Tulane’s students for that semester, but still, 80% of Tulane’s students came back in January. So the theme of the day was thanking this class for choosing to come back and bringing the university – and the city – back to life. 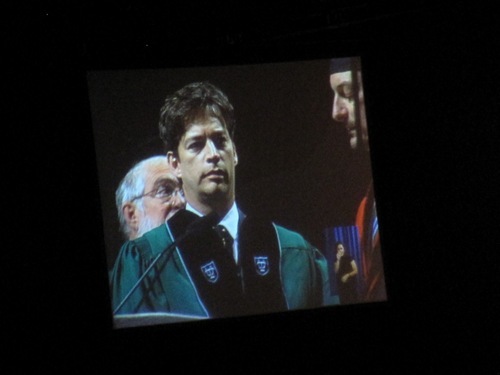 Harry Connick Jr. was given an honorary degree! Her speech was fun, witty, and casual. She said life is like Mardi Gras, but just don’t show them your boobies, show them your brain and you’ll get all the beads you need in life 🙂 Her message was about staying true to yourself. I definitely laughed out loud several times! 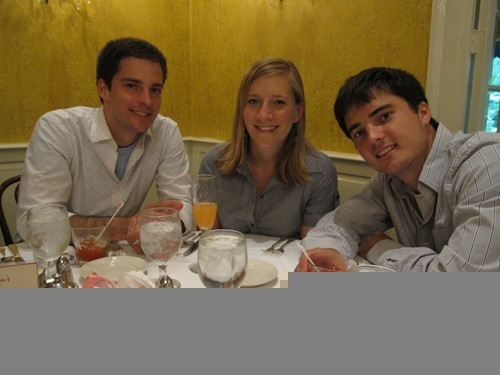 Breakfast held me over well – about 3 hours before my stomach grumbled. I let hunger build for an hour and then had the Oatmeal Raisin Walnut Clif bar at noon. LOVED IT!!!!!!! It reminded me of oatmeal cookie dough! I tried nibbles of the Blueberry Crisp (could take it or leave it) and the White Chocolate Macadamia (didn’t get enough to form an opinion). We were also prepared for a 6 hour ceremony (yes, SIX HOURS!!!) with reading material for the second half when they called out 1,000 names!!!!!! It went on forever…. The Clif bar held me over perfectly until 2pm brunch, when I wasn’t even that hungry. 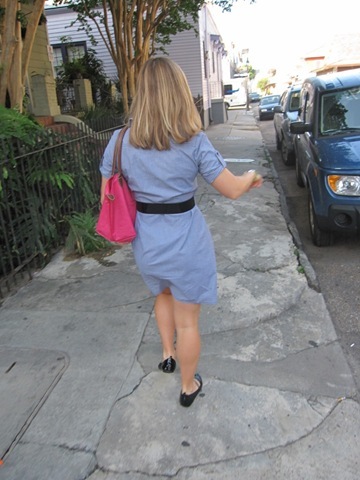 We walked another 30 minutes back to the French Quarter for brunch at Brennan’s. I was thankful for a second walk to squeeze in some more activity – esp. after 6 hours of sitting! 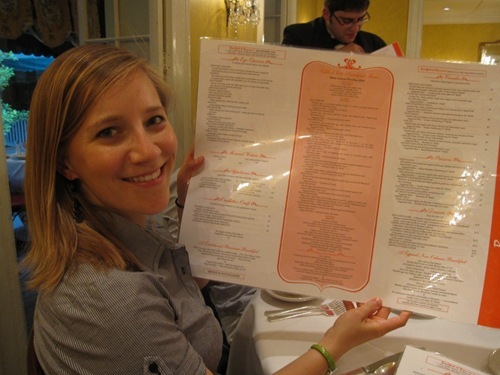 The menu was a little strange – not a single salad! The restaurant was quite expensive, and it ended up being more cost effective to get a three course pris fixe menu than just the entree, so that’s what I did. 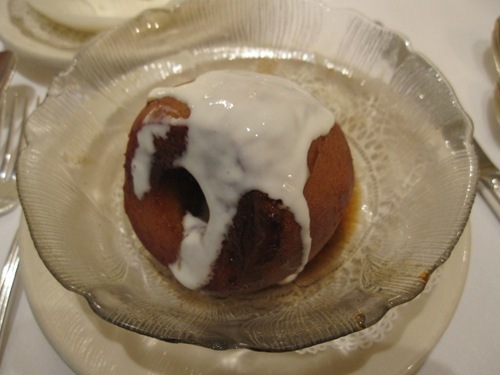 I started with the Baked Apple in Cream – but I got the cream on the side. 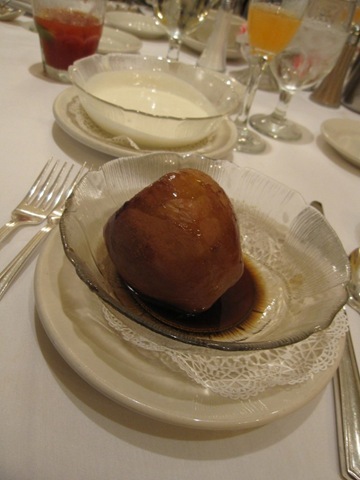 The apple was fabulous – I ate half of it and gave the rest to Matt. 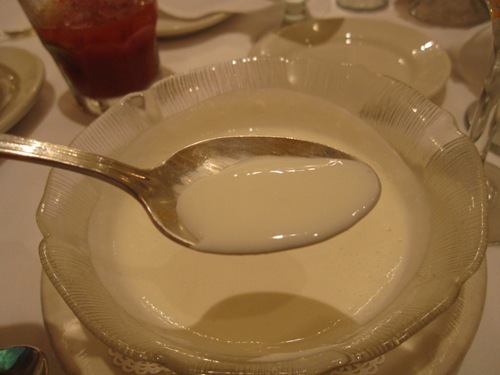 And may have tasted the cream a few more times as soup! It was like liquid ice cream! 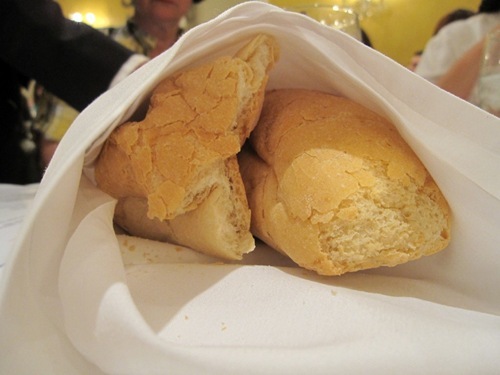 There was good bread on the table, but I turned that down knowing I had some in my benedict. Matt ordered it with his menu and gave me a bite. 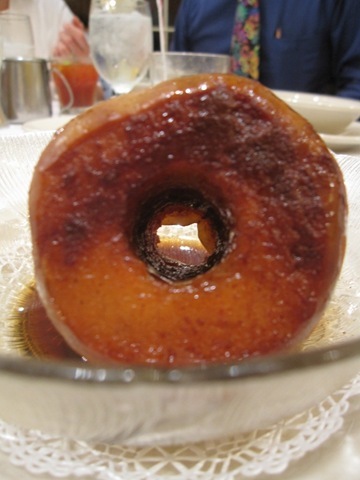 I have to say, that caramelized banana was one of the best ever! 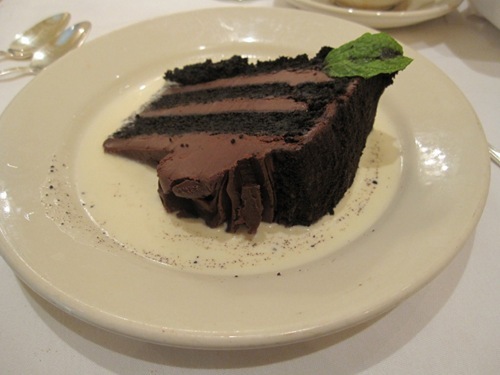 I was perfectly full before this cake, but it put me over the top! But a walk through the French Quarter helped with digestion. After all, Walking Is Good For Digestion! This meal should have been called Linner because it was 5pm by the time we left!! I don’t think anyone is interested in dinner. Perhaps just something liquid or GREEN! a six hour ceremony?? WOW! It must have been really exciting to see Ellen- I really like her. That Suicide Cake looks incredible! No doubt it was fabulous! I feel the same way as you after our LINNER- I am in no mood for dinner!!! Holy hell, what a perfect graduation ceremony. Celebrities up the hoo-hah and beads to boot! Looks like it was a blast!! 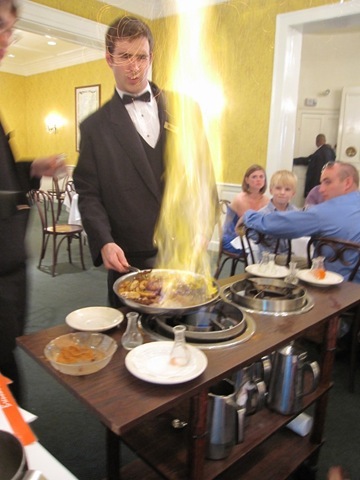 And followed by bananas foster?! I’m SO unbelievably jealous. kath you look really pretty today, like you’re glowing! have a fabulous evening! 6 hours? AHHH. I cannot imagine. I like your pink bag, btw. you’ve had such luck lately with the speakers. first oprah, and now ellen. 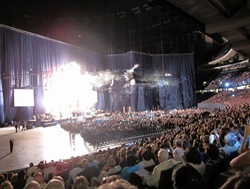 high profile graduations! Holy cow, that is a long graduation. But the meal afterwards looks absolutely amazing! Walking is definitely the best way to see the city. Plus, you get some great exercise! 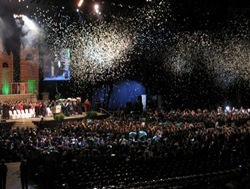 Sounds like the graduation was a lot of fun, but WOW! 6 hours is a LONNGGG time! Oatmeal Raison Walnut is definitely my favorite flavor. YUM! What a great dinner! Everything looks great. Sounds like you had a fun time! Kath, What hotel are you staying at? 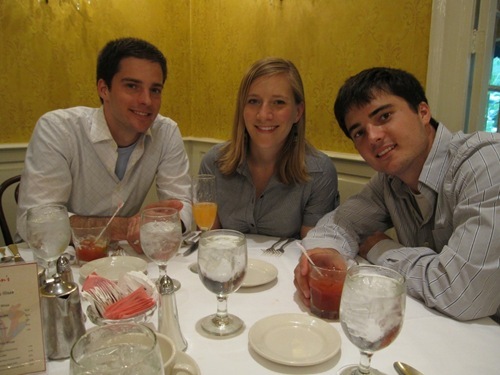 We were going to go to Brennan’s because it got rave reviews, until we saw the prices on the menu. 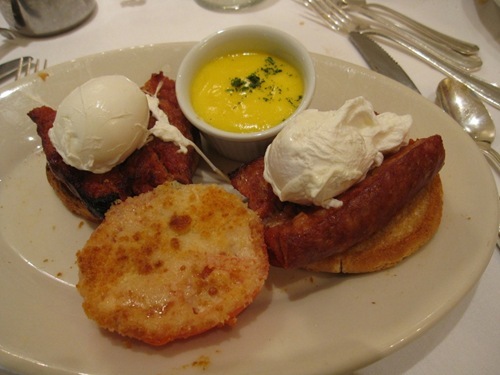 It looks awesome, but we were just unwilling to pay that much for breakfast! 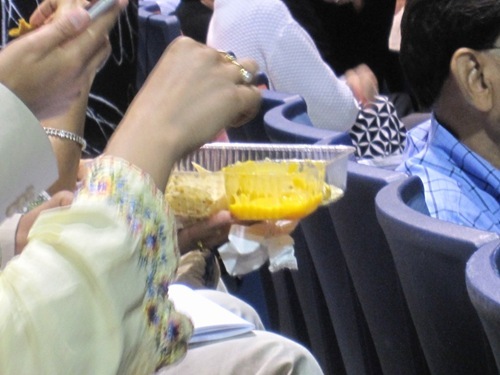 why is it so bad to eat nachos if you’re hungry? i mean, they chose chicken fingers and you chose “liquid ice cream” and chocolate cake. which is really the lesser of two evils? First Oprah, then Ellen?!? Lucky girl. That dinner looks decadent! wowzers, 6 hour ceremony!? crazy! Love Ellen!!! She’s so fabulous! 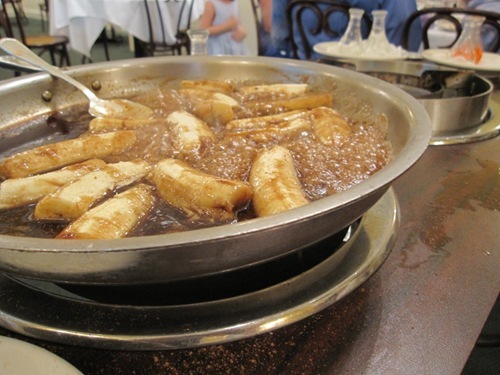 Bananas Foster is one of my favorite things on Earth, you just reminded me that I haven’t had it in years! 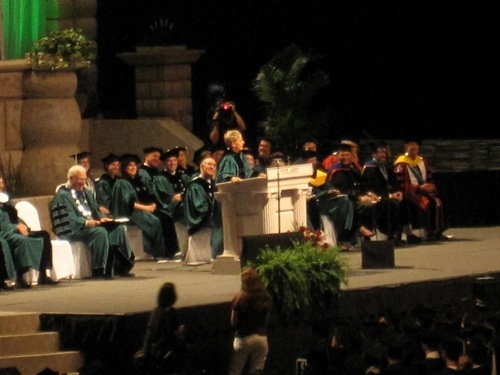 oh man i would go and sit for 7 hours at a grad speech to listen to Ellen ANY day! glad you’re having a wonderful time with family! I love Ellen, it must have been so much fun to hear her! Lovely eats! OMG. I know exactly how you feel about the ceremony being sooo long! I thought the ceremony when Jason graduated would never end! 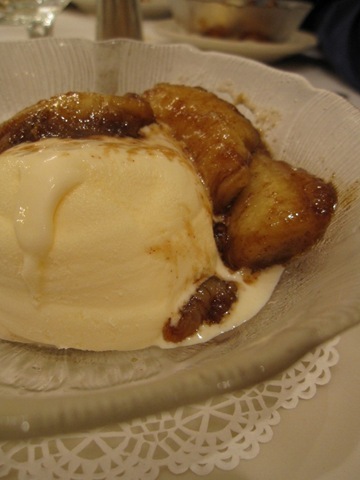 I loooooove Bananas Foster! Mmmmm. You’ve gotten to see the coolest people speak this year!!! Safe travels! Wow, a 6 hour ceremony is INTENSE. 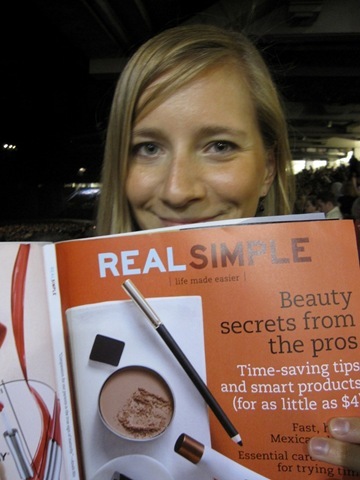 Love that you came prepared with two of my fave things: Real Simple mag and Clif bars! CUTE! I love you outfit!! Congrats to the graduate! That’s really pretty crazy to think that this class was in the thick of all the craziness that happened with Katrina. Wow, 6 hours! 😮 Holy numb feet! lol Linner looks delicious, especially the desserts!! 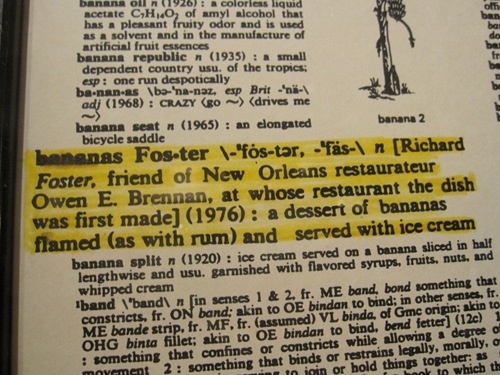 I look forward to trying Bananas Foster in NOLA one day. Love your dress! It’s so cute. 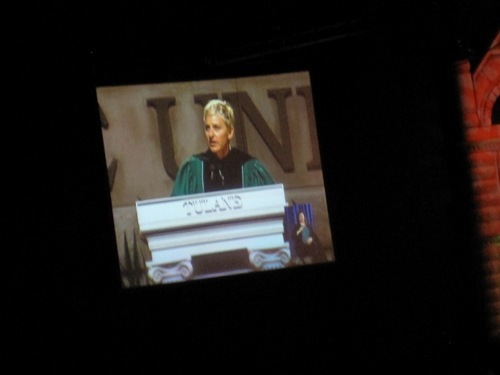 So cool that Ellen was at grad! a# 1 – You look great! I pink puffy heart your dress. c # 3 – Great looking eats – as usual! 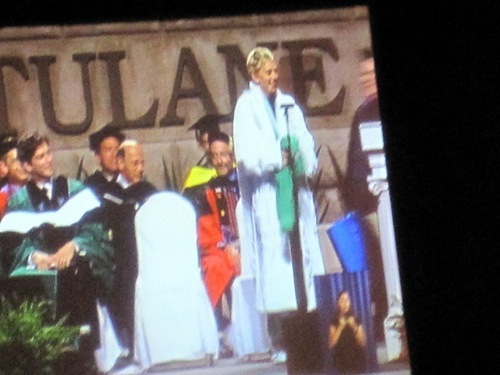 I remember how long the Tulane grad ceremony is from when my fiance’s sister graduated last year – wowza. Six hour graduation?! I would have gone stir crazy, but hearing Ellen speak live might make it worth it 🙂 I love Ellen. 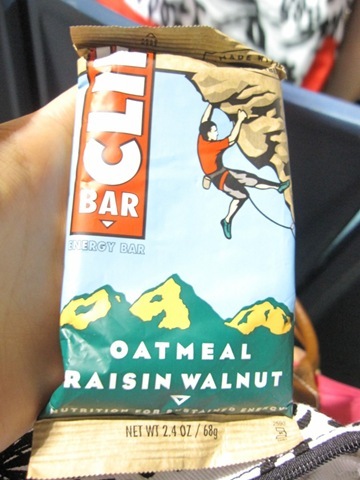 That Cliff bar sounds delicious – I love Oatmeal Raisin cookies and cookie dough, so it would be right up my alley. Sounds like you had a great “Linner”. 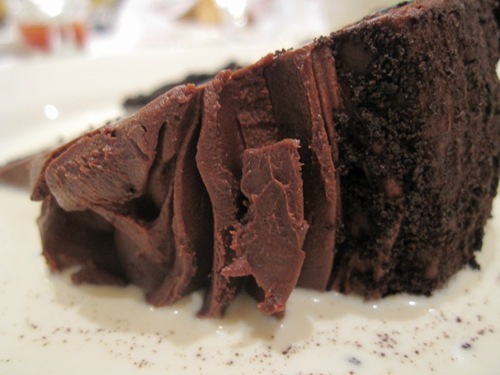 That chocolate cake looks out of this world! adorable dress for the graduation!! where did you get it if you dont mind me asking? What fun speakers!! I would have loved toseen ellen!!! 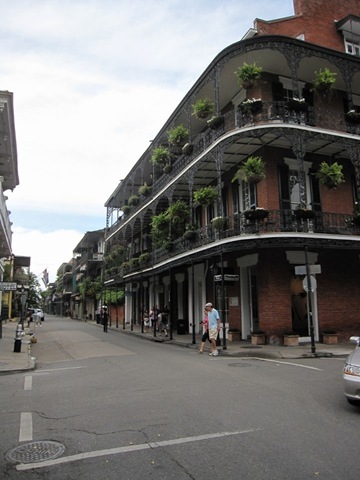 NOLA sounds like an amazing place to vistit! btw Cute ctue cute dress! 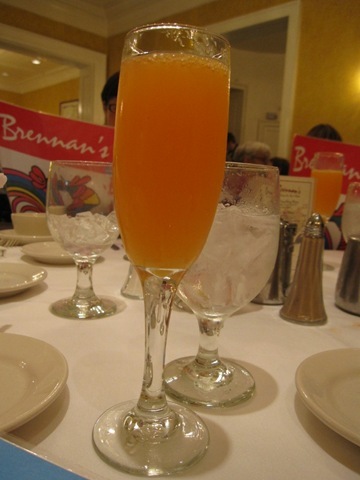 Brennan’s is fabulous! 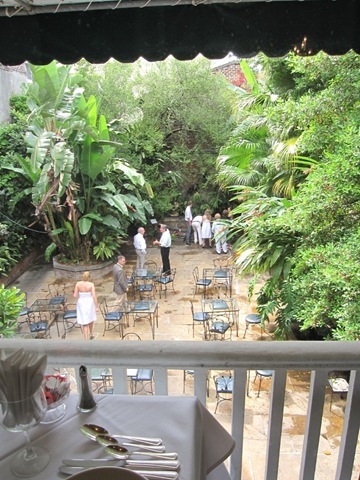 One of my bridal showers was held there and it is def. 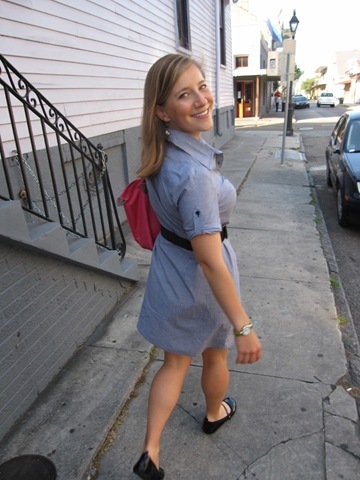 a favorite memory from my time in NOLA. Brunch there was always a favorite for out of town guests too. Looks lucious! 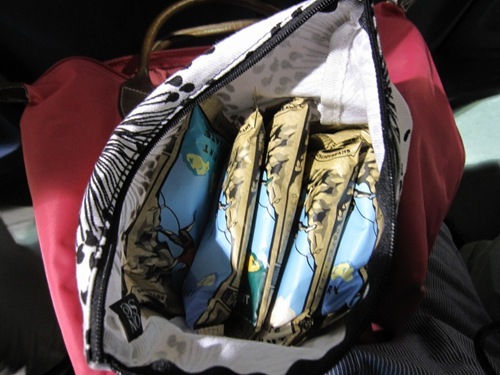 The White Chocolate Macadamia Clif Bar tastes like a candy bar, IMO.